FAQ - How do I change my contact information? In your account, click on My Profile in the drop down menu of Options located under your profile name. Then click on Edit Profile & Preferences tab in the left hand navigation bar. On the following screen you’ll be able to edit your profile name, address, phone number, etc. 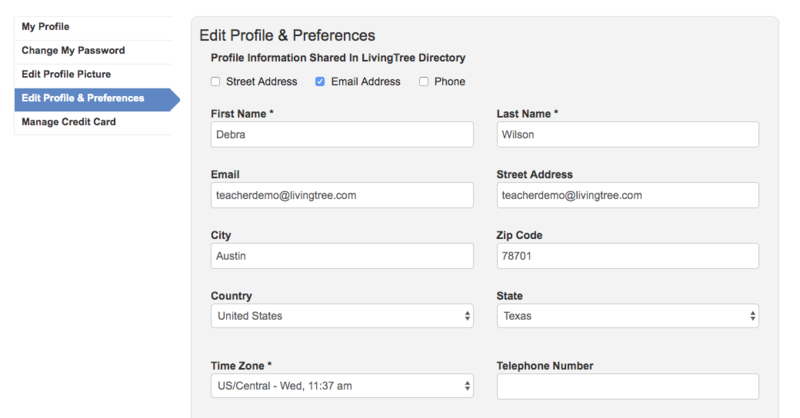 To allow certain contact information to be visible for other Livingtree contacts, check the pertinent box(es) at the top of the page. Once done editing, click the green Save button on the bottom left of the page. Contacts will see the information you’ve selected when they click on your name in their Directory.